The annual Little Flower Teen Writers Festival is a school-wide celebration of writing and reading—a marvel of an invention in which a school, on a sunny Saturday, opens its doors to story weavers and student hearts. The dynamic, unstoppable Sister Kimberly Miller leads the way. Her girls wouldn't be anywhere else. And yesterday all of us who were in attendance were given keynote words from A.S. King that leapt us to our feet (yes, that's a deliberate inversion of language logic, but that's so what happened). King is one of those writers who has earned her status as a star. Her stories are essential. Her sentences are prime. And when she gets up there behind a microphone she has something actual to say—words that belong to her, ideas unborrowed. I left Little Flower, rushed home, put on a skirt, swapped out my graffiti boots for a pair of four-inch heels, picked up the cake I'd made the day before, and headed out again to celebrate the career of Greg Djanikian, the exquisite Armenian poet whose life and work I profiled in the Pennsylvania Gazette last year. Greg is stepping down from full-time administrative duties at Penn so that he might write more and live less bounded-ly. Saddened as we are by the thought of seeing him less, last night was anything but a sad event. It brought together (in true Greg fashion) the teachers, writers, and student advocates who give Penn's creative writing program and Kelly Writers House their aura. Oysters, sherbet-colored shirts, an undaunted cat. Talk about food carts, the meaning of words, 1960, serial memoirists (the third Fuller), astonishing turns in storied careers, the art of the frittata, and the costs and high rewards of loving students. Sun when we arrived and stars when we left. 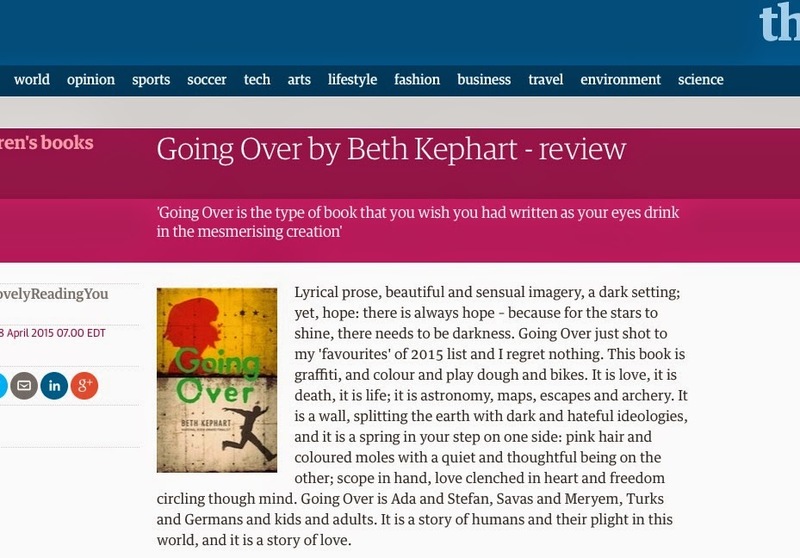 In between the two events, Kit Hain Grindstaff sent word of something wholly unforeseen—a Guardian review of Going Over. It begins like this below and can be read in full here. Lyrical prose, beautiful and sensual imagery, a dark setting; yet, hope: there is always hope – because for the stars to shine, there needs to be darkness. Going Over just shot to my 'favourites' of 2015 list and I regret nothing. This book is graffiti, and colour and play dough and bikes. It is love, it is death, it is life; it is astronomy, maps, escapes and archery. It is a wall, splitting the earth with dark and hateful ideologies, and it is a spring in your step on one side: pink hair and coloured moles with a quiet and thoughtful being on the other; scope in hand, love clenched in heart and freedom circling though mind. Going Over is Ada and Stefan, Savas and Meryem, Turks and Germans and kids and adults. It is a story of humans and their plight in this world, and it is a story of love. As is perhaps clear in this recent Huffington interview, I've been thinking a lot of late about what happiness is. 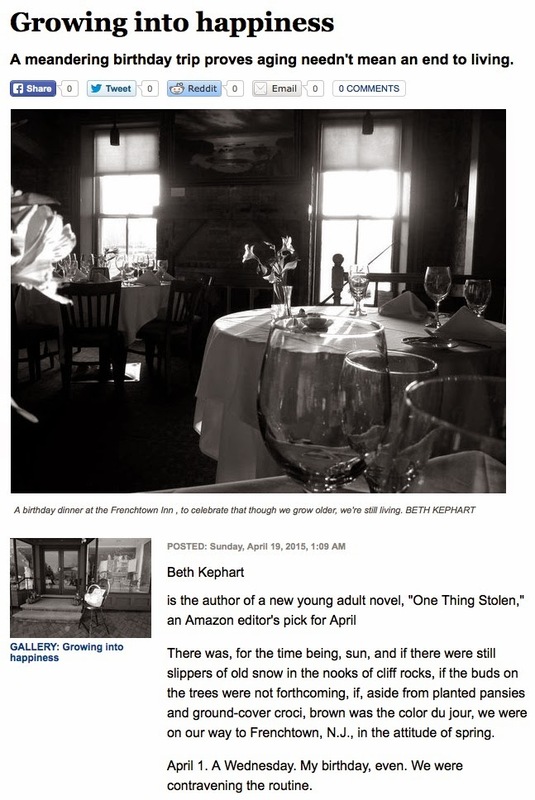 I wrote toward that in today's Philadelphia Inquirer story, which has Frenchtown, NJ, as its backdrop. (Thank you Kevin Ferris and your team for another beautiful presentation of my photographs and words.) 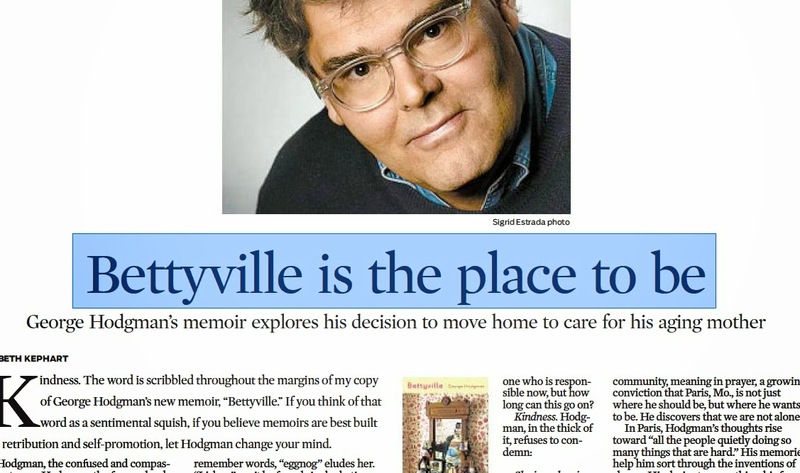 I've been also thinking a lot about kindness (never simple, often rare), thanks in part to George Hodgman's glorious memoir, Bettyville, which I reviewed for the Chicago Tribune, here. Today there is sun out there, flowering trees, wet-headed daffodils. I'm going to celebrate by finishing the fabulous Between You and Me (Mary Norris) and later checking into Chanticleer garden for the first time this year. I'm way overdue for a visit.